Serious about jobs? Rein in the regs! Why aren't we drilling in the Gulf? 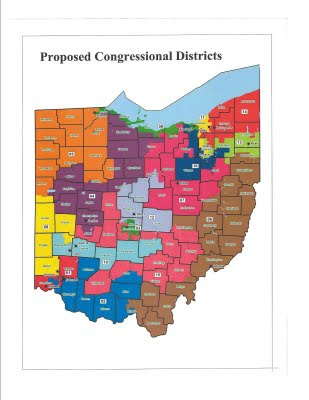 Ohio and the 'Big Labor vs. Taxpayers Index"
Below is the congressional redistricting map that was introduced today in the House State Government and Elections Committee. Press release is below the map. You'll note that our Congressional District 9 has been changed. It used to contain Toledo, Oregon, Jerusalem Township, and all of Ottawa and Erie Counties, with just a small portion of Lorain County. Now it contains a small portion of Ottawa, about half of Erie and extends into Lorain County with a portion of Cuyahoga carved out for inclusion. It also looks like Oregon has been excluded from the district. It still follows along the edge of Lake Erie, but talk about gerrymandering - no one in their right mind would draw a district like this. COLUMBUS—Today, the House State Government and Elections Committee unveiled the new map of Ohio’s congressional districts, which accounts for population changes over the past decade as determined by the federally administered decennial census. The proposed map treats incumbent candidates equally, with three Republican and three Democrat incumbents drawn into overlapping territories as a result of slow regional population growth. The congressional redistricting plan also protects the civil rights of minority communities by complying with the clear precedents of the federal Voting Rights Act and the U.S. Supreme Court in creating an African American majority-minority district in Cuyahoga and Summit counties. It also creates a minority opportunity district in Franklin County. The congressional district map as outlined in House Bill 319 is the result of months of work and adheres to all requirements set forth in law. ...no one in their right mind would draw a district like this. This again confirms my suspicions. And, considering Mousie's so-called opposition, it would appear to virtually guarantee Mousie's reelection.